Having to clean off brushes constantly or potentially forgetting to clean one off can ruin your entire project in a matter of seconds. We've developed these markers for our colleagues to relive the stress in having to clean up the mess and focus more on the artwork. Click Add to Cart now to take the mess out of the equation. 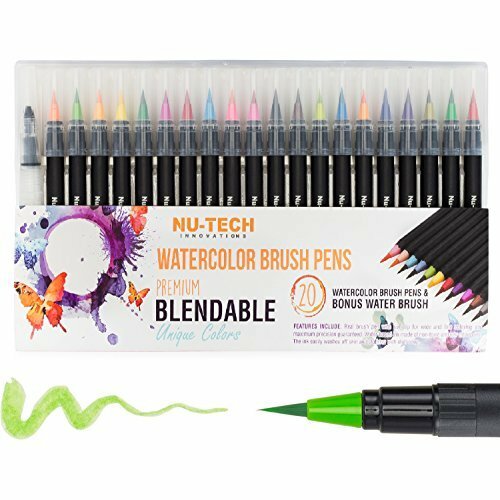 Nu-Tech Innovations Watercolor Brush Pen Set - 100% Satisfaction Guaranteed! As soon as your order is shipped we will email you the watercolor guide and coloring book pages so you're prepared to hit the ground running! HOW LONG WILL THESE LAST This 20+1 pen art set is for beginner to experience artist who typically paint between 15-20 12"x12" canvases. Nu-Tech has seen that with proper care and maintenance the standard artist can produce a significant amount of artwork with very little mess and low margins of error using the fine tip bristles. Specifications: 20 Very vibrant colors made of durable and leak-free plastic. Our pens are made perfect for everyone from a new artist to experienced award winners. 1) Dab a small cloth or paper towel with water and gently apply pressure to area of excess color. 2) Let the water dry and repeat process with standard dish soap if necessary. Watercolor Safety: Be sure to keep the caps of the pens away from small children as they are a choking hazard! For The Best Valued Watercolor Markers Choose Nu-Tech Now! If you have any questions about this product by Nu-Tech Innovations, LLC, contact us by completing and submitting the form below. If you are looking for a specif part number, please include it with your message.